The Philadelphia Energy Solutions plant in southwest Philadelphia plans to host a biogas facility that would turn food waste into natural gas. 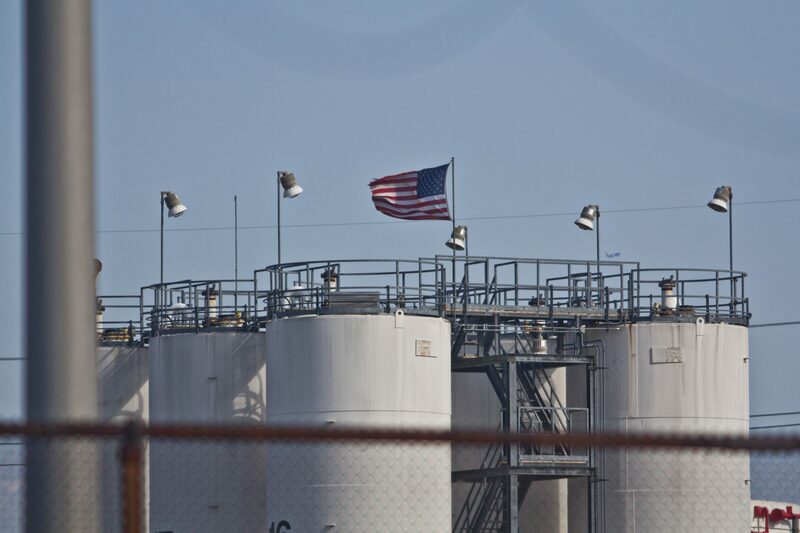 Philadelphia Energy Solutions is the largest refiner on the East Coast, taking Bakken Shale oil from North Dakota and turning it into gasoline. The company is the largest stationary emitter of particulate matter in the city. Zalaka Thompson lives less than a mile from the largest oil refinery on the East Coast, which turns crude oil from the Bakken Shale formation in North Dakota into gasoline. The Schuylkill Expressway, a major interstate highway, separates her home from Philadelphia Energy Solutions, and she says the facility impacts her family daily. Her 14-year old son has asthma and carries an inhaler with him at all times. Some mornings, she can’t keep her windows open for long without smelling something akin to sulfur or gas. “I like to open my windows for fresh air, but sometimes I have to close them,” she says. The refinery is Philadelphia’s single largest stationary source of particulate pollution, according to city data. Particulate matter includes a mix of tiny particles that can damage lungs and cause respiratory diseases. In the 19145 zip code, which Thompson and her son call home, asthma is common among children, and the rates of hospitalization for the ailment are among the highest in the city. But even as PES moves toward financial sustainability, neighbors like Thompson say the refinery isn’t doing enough to reduce its environmental impact locally. She hopes the bankruptcy will inspire the company to rethink how it does business across the board. Zalaka Thompson lives a couple of blocks from the PES refinery in South Philadelphia. She’s on a campaign to reduce its air emissions. Since last year, Thompson has been working with Philly Thrive, an environmental organization, to raise awareness about the refinery’s public health costs. In November, the group scored a win: Philadelphia’s new Clean Energy Vision draft stipulated the need for a city-wide conversation led by the Office of Sustainability “to determine the future of the South Philadelphia oil refinery” in light of the city’s goal to reduce carbon pollution 80 percent by 2050. Christine Knapp directs the Office of Sustainability. She says the city is committed to raising issues about the refinery and its contribution to climate change and local health problems. She says her department won’t make recommendations until the final plan is published. The move gives hope to Thompson. Philly Thrive started surveying the refinery’s neighbors last May and found that among 314 respondents, more than half of them had either heart disease, cancer, or a respiratory condition. Almost 34 percent of them had asthma. In the city, the rate is 19 percent of the population; nationally, it’s 8 percent. Alexa Ross, a 27-year-old staff organizer at Philly Thrive, noted that the EPA labeled PES a high-priority violater since April 2012, and says hasn’t complied with the Clean Air Act and Clean Water Act. “It’s baffling to us that such a major source of pollution is just really absent from the conversation,given the asthma rates in the city,” she said. Dr. Marilyn V. Howarth, director of community outreach for the Center of Excellence in Environmental Toxicology at the University of Pennsylvania’s Perelman School of Medicine, said it’s difficult to link any particular illness directly to the refinery. That’s because air pollution is not necessarily distributed uniformly, and there are other factors that could cause asthma, including heavy traffic from a nearby highway. Asthma has a number of causes, including cigarette smoke, mold, or even cockroach waste. Howarth said the refinery is also the largest single source of EPA’s criteria air pollutants like nitrogen dioxide and sulfur dioxide. All of those emissions, including particulate matter, are associated with either causing asthma or exacerbating it. “There are thousands of studies linking air pollution to health effects like asthma, worsening of other chronic respiratory disease, heart attacks, and cancer,” Howarth said. According to the activists’ survey report, 82 percent of the neighbors had negative feelings about the refinery, citing health issues. Asked about what they would like to see happen if the refinery shuts down, most of them said the site should be cleaned up, and that the refinery should pay for damages. Carol Scott, 71, moved to a Philadelphia Housing Authority senior center about a mile from the refinery 10 months ago. She’s not happy about her new home. She has asthma and said she’s been wheezing a little more recently. She can see the refinery’s smoke from her window. “It’s just all over,” she said. But what worries her the most are the trains transporting highly flammable crude oil to the refinery, which the neighbors and activists refer to as bomb trains. That’s a reference to an accident in Lac Megantic in July 2013. A similar crude oil train full of Bakken Shale oil rolled down a hill unattended into the town. It exploded and killed at least 42 people. Peter DeCarlo is a climate and air pollution scientist at Drexel University. He studies the pollutants — chemicals like benzene, toluene and xylene— lurking in the smoke Scott sees daily from her window. “These are gases — these are not typically particles — and are known to be carcinogenic, which means they cause cancer, and they are a byproduct of the refining process,” DeCarlo said. “We clearly see elevated levels of these pollutants in the immediate area of the refinery, and as they go downwind, they’re going to dilute [into the air]. “The refinery is a massive, massive facility and its emissions are going to dwarf the emissions for something like the Nicetown power plant,” said DeCarlo, referring to Septa’s proposed natural gas plant, which is opposed by green groups. In an EPA screening-level model, which analyzes factors that contribute to human health risk including the amount of chemicals released, the degree of toxicity, and the size of the exposed population — the PES refinery has a score almost 10,000 times higher than the petrochemical industry median. In an attempt to put the refinery’s emissions in context, DeCarlo used data from EPA’s Toxic Release Inventory such as benzene, toluene, and other carcinogens, and compared that to the Pennsylvania’s DEP Marcellus Shale Emission Inventory, a collection of self-reported emissions data submitted by operators of well sites and compressor stations. The emissions of the refinery, he said, were on the same scale as the statewide Marcellus shale production activities. DeCarlo argues PES is not doing the measurements with the precision required by a 2012 consent decree between the Commonwealth of Pennsylvania, the City of Philadelphia, Sunoco and PES. He says it is combining the less toxic methane emissions with cancer-causing volatile organic compounds, which masks the more dangerous VOC measurements. While methane is a potent greenhouse gas that contributes to climate change, it is not a public health threat like VOCs. Last October, DeCarlo exposed the discrepancy to Philadelphia’s Air Pollution Control Board. But the Health Department’s James Garrow said in an email that PES is complying with the consent decree. A spokesperson for PES agreed. Philadelphia Energy Solutions did not respond to questions regarding the impact of its air emissions and residents’ health. Office of Sustainability director Christine Knapp doesn’t dispute that more could be done on a regulatory level to protect residents like Thompson and Scott. When she was working with the Clean Water Fund in 2005, her organization and others actually sued the refinery for “years of environmental violations” that exposed residents to pollution emissions, flaring, and foul odors. But Knapp may be in for an uphill battle. At a time when the city is fighting to hold on to jobs and a shrinking manufacturing sector, Knapp’s boss, Mayor Jim Kenney, may find his priorities tested. Cherice Corley, PES spokesperson, said that 15 to 20 percent of its workforce lives within the city of Philadelphia, adding that “with family-sustaining jobs earning $100K+ per year,” many move to the suburbs after a few years. PES is also starting a program for skilled trades targeting local residents, Corley said. PES’ Corley said the refinery supports neighborhood programs, including the South Philly Hurricanes Youth Athletic Association, the Southwest pride day, Bartram’s River Festival, and the South Philly Business Association scholarship program, among other community groups and events hosted by council member Kenyatta Johnson (D) and State Rep. Jordan Harris (D-Philadelphia). Clean Air Council’s Russell Zerbo said the refinery is getting pressure from both market forces, and public health organizations like his, which sued PES in 2012. Sixty-six year old Irene Russell has lived in Grays Ferry all her life. She said her daughter and a couple of her grandsons have asthma, and that some friends have died of cancer. She blames it on the refinery but says she’ll never move out of her neighborhood. “If I’m not in Grays Ferry, then I’m nowhere in Philadelphia — I’d rather go to Florida,” Russell said. Still, the refinery needs to be held accountable, she says.